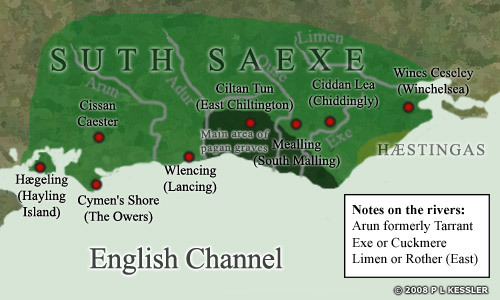 By this stage, fifty-three years after the first Saxon landings here, the names of the rivers were English and, except for the Adur and the Ouse, even the Celtic derivations of their names is debatable. This map illustrates the conjectural centres of royal power. While Cissa had altered the polity of the South Saxons (Suth Saexe), Cerdic was an active warlord as king of the West Saxons.